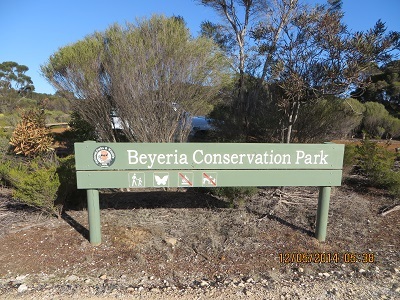 Baudin Conservation Park, like Scott Creek Conservation Park in the Adelaide Hills, had an earlier life. It was a farm from 1861 to 2001. The farming family was called Bates and there are some preserved areas in the Park that commemorate their lives. The Ironstone Hill hike takes walkers past the various relics of the past related to the family. We wanted to visit this park because it is a home to the endangered Glossy Black Cockatoo, called the Glossies, but we did not see any! There are estimated to be about 300 birds left on the Island. The land was created a Park to give the Glossies a greater chance of survival as their Sheoak trees grow there. They must have been visiting elsewhere! The Park is just two kilometres from Penneshaw. For an amateur who wants to visit the Island and activate the park there is a market day on the first Sunday of the month (from 0900 to 1300 hours). You leave your car on the mainland and catch the ferry to Penneshaw. 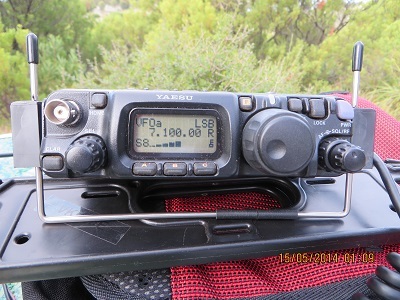 Just a two kilometre (hilly) walk and you can be on the air! The cost is just $40. What a great training ground for a potential SOTA activation! The Park is named after Nicolas Baudin (17th February 1754 to 16th September 1803). He died in 1803, at 49 years of age, of tuberculosis, often referred to in literature by its older name of consumption. In 1802 Matthew Flinders met Nicolas Baudin at Encounter Bay near the modern day Victor Harbor. Many French names are used on Kangaroo Island because of Baudin’s exploration of that area. Eight contacts were enjoyed: VK5GJ, Greg; VK3AMB, Bernard; VK5KGP, Graham; VK5GI, Norm; VK3UT, Greg; VK3BHR, Phil; VK3PF, Peter and, finally, VK5ZGY, Greg. 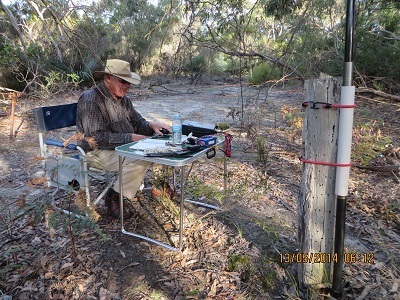 Today I finished digitising my log and uploading 119 contacts from Kangaroo Island to Logbook of the World. Thanks to all those amateurs who shared something of this wonderful island with me as we travelled around the various parks. 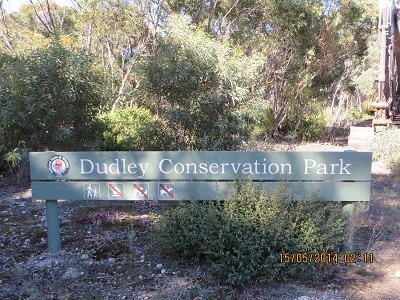 Dudley Conservation Park is on the Dudley Peninsula. 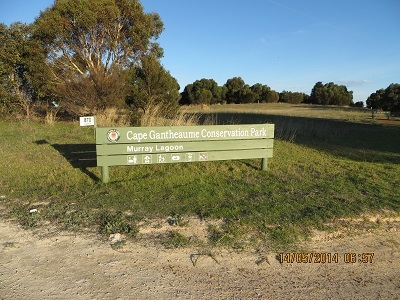 The Park was created by notice in 1970 and it conserves the Kangaroo Island Narrow Leaf Mallee. The Parks brochure indicates that there is a track around the park which can be used by walkers. We took the main East – West Road which passes through the Park and found a track to an old road which makes up part of the walking trail. It was not far off the main road and was a great place to set up. 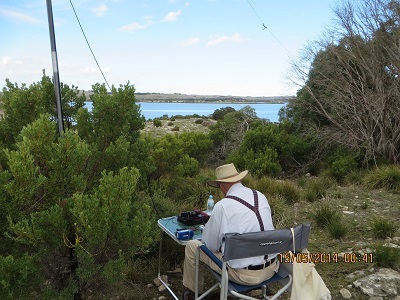 Sixteen contacts were made from Dudley Conservation Park: at 03:01 VK5ZAR, Arno; VK5GJ, Greg; VK3AMB, Bernard; VK5FPAC, Bob at 03:25 5 and 7 and 3 and 4; and at 03:25 VK5FPAC, Bob with 5 and 7 both ways, a much better result; VK5LG, Greg; VK5GJ, Greg; VK3PF, Peter; VK3BHR, Phil; VK5NFB, Don at Williamstown; VK5HCF, Col; VK5HS, Ivan; VK3LY, Bill; VK5HCF, Col now at the SERG club-rooms with less noise at his end; VK5XGY, Greg and VK5DJ, John. While at the Friends of Parks Inc. Forum I heard Parks staff refer to small Parks as ‘Pocket Parks’. 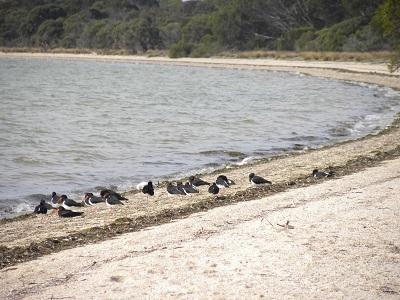 Nepean Bay Conservation Park is clearly a pocket park: it is a mere 30 hectares and conserves typical Kangaroo Island coastal sand plains habitat. It was gazetted in 1974. We had a challenge in locating this park. We could not find any signs. But, we did find the boundary fence. I am a devotee of good maps and GPS technology! We travelled down a long, winding track, running parallel to the shore-line until we could go no further. There were too many trees were across the track as a result of strong winds and storms. Eleven contacts were enjoyed from this Park beginning at 04:01 UTC. They were: VK5LY/M, Larry; VK5KGP, Graham; VK3PF, Peter; VK2JDS, Dave; VK5FD, Allan; VK3XNH, Neil; VK5ZAR, Arno; VK5AN, Graham; VK3AFW, Ron; VK5ZGY, Greg and VK5NFB, Don. 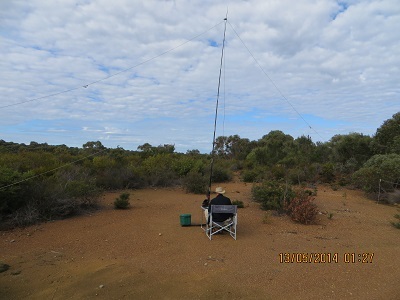 My operating position was just a few metres away from the beach and partially shaded by coastal scrub. One could describe such a spot as idyllic! 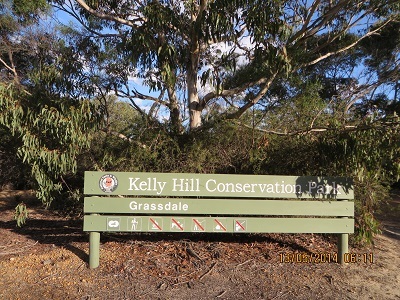 Kelly Hill Conservation Park, of 21,254 hectares, is known for its ‘extensive cave system, wilderness areas and beautiful coastal scenery’. We found a spot near Gate 1, no where near the main entrance to the caves, and were thus undisturbed except for some contractors leaving the Park in a minibus. I had contacts beginning at 06:08 UTC beginning with: VK5KGP, Graham; VK5GJ, Greg; VK5WG, Nev; VK3AMB, Bernard; VK5TW, Trevor; VK5KLV, Les; VK5ZGY, Greg; VK5ZQP, David; VK5LY/P3, Larry in Murray-Sunset National Park; VK5ADL, David; VK3LY, Bill; VK5GI, Norm; VK5NAQ, Peter; VK5ZAR, Arno; VK3PF, Peter; VK5FO/M, Bob; VK3BHR, Phil; VK2NEO, Peter and VK5LY, Larry making 19 contacts in all. 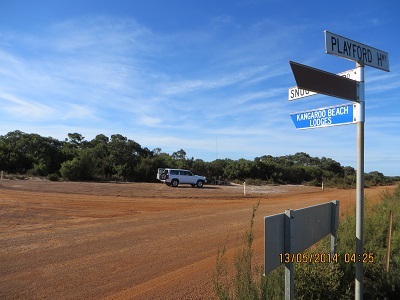 If you have a look at a reasonable map of Kangaroo Island there is a dot indicating the highest point on the Island. The dot is on the corner of Playford Highway and Snug Cove Road. The summit is un-named. VK5PAS, Paul and VK5AKH, Andy activated this summit in August 2013 in weather which even the ducks would complain about! We were more fortunate with the weather. It was a warm day and a shirt without jacket was fine. 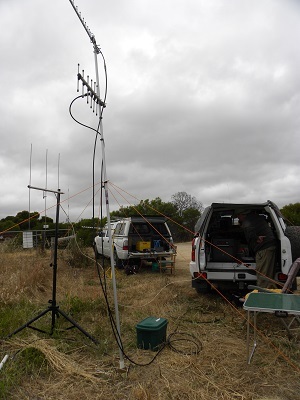 I was able to enjoy twelve contacts on 7.090 beginning at 04:22: VK5TW, Trevor; VK5ZGY, Greg; VK5GJ, Greg; VK5LI, Craig; VK5FD, Allan; VK3AMB, Bernard; VK5WG, Nev; VK5BC/M5, Brian; VK5KLV, Les; VK3BHR, Phil; VK5FAKV, Shawn and VK5PI, Mark. This is an easy summit, with the high point being just off the road, behind our vehicle, in the trees. 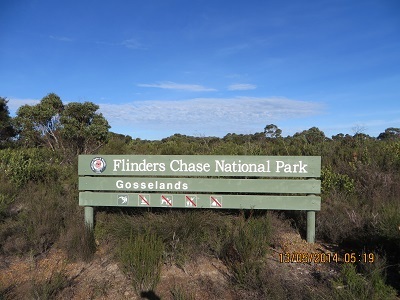 Flinders Chase National Park is the iconic Park on Kangaroo Island. 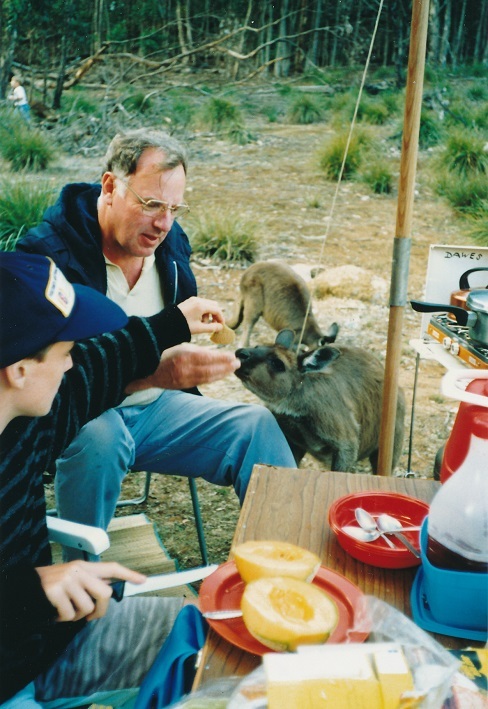 The Park contains the Remarkable Rocks, Admirals Arch vast areas of wilderness and Kangaroos who know how to raid your tent, well at least that was the case on our first visit there many years ago. It is probably not like this now: the Parks authorities actively discourage the feeding of native animals and there have been a number of significant fires through the Park. You can also sharpen up your surfing skills by watching the seals at play. They are fantastic. 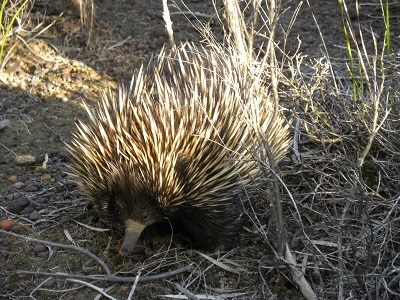 To give you an idea of the size of Kangaroo Island Flinders Chase National Park is 110 kilometres west of Kingscote. 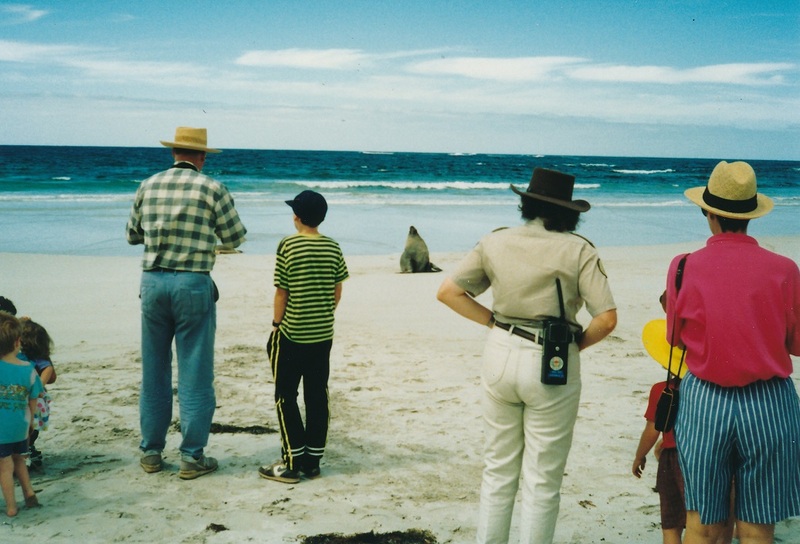 The brochures advising of the attractions of Kangaroo Island mentions its size, by stating it is the third largest island in Australia. Well can you work it out? I couldn’t at first. Here is the answer. While the Australian mainland is an island it is also a continent. So take that out of the equation. Tasmania is the largest island, then Melville Island in the Northern Territory then Kangaroo Island. We did not go to the main part of the Park on this occasion. We chose to keep the trip west as short as we could and thus activated from the eastern end of the Park. I found a great spot in this Park just off the Playford Highway. We carefully negotiated a rather damp track watching for any signs of softness in the gravel. I set up in the usual way and always wondering how it will all turn out on the day. It was great. 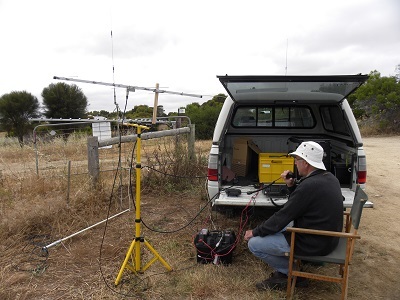 Fourteen contacts kept me busy: VK5ZAR, Arno; VK5KGP, Graham; VK5KLV, Les from Port Augusta; VK3AMB, Bernard; VK3FQSO, Amanda; VK5TW, Trevor; VK5AV/M5, Tim near Lamaroo; VK5ZGY/M5, Greg; VK3UP/P3, Terry at Ballarat; VK3NFC, Steve; VK5NAQ, Peter; VK3LY, Bill; VK5BC/M5, Brian and VK3FJAE, Doug from Maryborough.